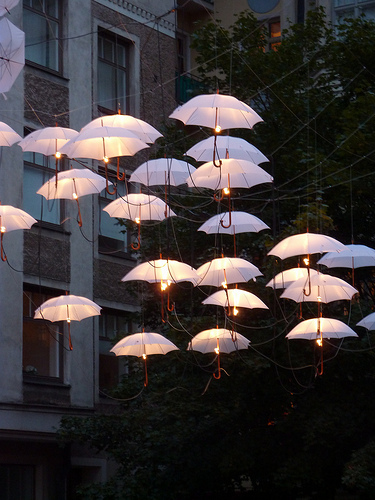 The other night I was surfing through Pinterest and came across this fun and whimsical picture of suspended umbrellas turned into lights. 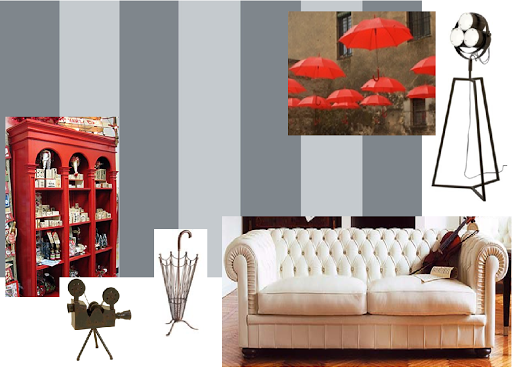 It sparked my imagination and inspired me to come up with idea boards for Singin’ in the Rain themed living rooms. The first thing that came to mind was mono-chromatic wide stripes in shades of grey for the walls. I’m actually thinking a metallic or high-gloss for the lighter grey would really give a cool, water/rain illusion. Then I had so many ideas rattling around in my brain that I ended up doing two concepts. 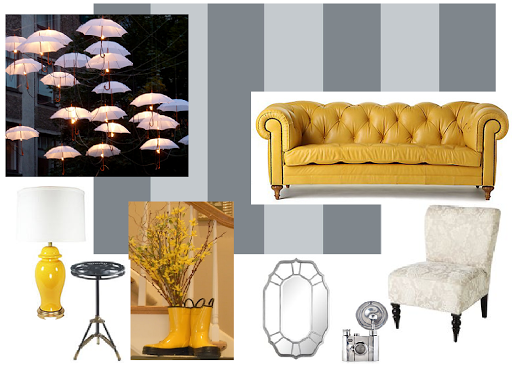 First up I thought tying in the classic bright rain coat yellow would be a cool and slightly contemporary spin on the color palette for this room. I also enjoy the idea of taking traditional style furniture pieces, such as the tufted couch below, and pairing them with a bright and non-standard color. Other fun elements include rain boots as flower vases and a film reel side table. Second I went with what I consider a more traditional, old Hollywood style, color palette of grey, black, and white with pops of red. Another thing I really like about this is the mixing of textures from the plush sofa, to the industrial metal floor lamp to the classic wood bookcase. Those are the types of pieces I feel give a room character and prevent it from looking too staged. Would you try a movie themed room in your house? Any decor inspirations or ideas strike you recently? We’d love to hear what’s on your mind.